One my biggest takeaways from my time in culinary school has been the magic of a good sauce. This is particularly emphasized in a classical-style, French program like the one I went to and I definitely still put it in practice several years later. Making a sauce doesn’t have to be difficult and it can instantly take a dish up a couple of notches. It’s also really easy to make slight variations that can take flavors in completely different directions. To that point, this is really a play on a classic velouté–basically stock thickened with a roux. This is pretty much the case for so many of the sauces I make on the fly at home. Here, I make use of aromatic roasted garlic (see my recent Building Blocks post) to make an easy sauce that’s absolutely luscious and can be used in so many ways. 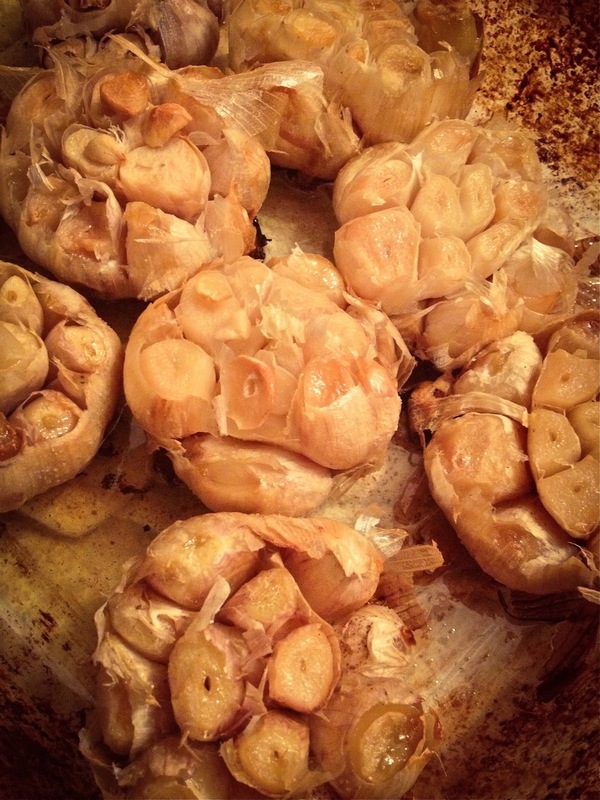 You might find it odd to use both roasted and raw garlic, but they really have different flavors. I added more un-roasted garlic to bring a touch of piquancy to the otherwise smooth, sweet flavor of the roasted garlic. You can easily leave out the raw garlic if you prefer. Also feel free to use whatever kind of stock suits you best. Chicken works beautifully, but beef stock can take things in a richer direction, or use veggie stock to keep things vegetarian. The dish at the top might look complicated, but really I just used this sauce to top some amazing ravioli I bought at my local farmer’s market–any fresh ravioli would work. While the sauce was simmering I grilled up some bacon bits and trumpet mushrooms in a pan to top of the dish. You can easily switch out any other veggie that you have around or is in season. Then I garnished the plate with microgreens just to be fancy since I happened to have some around. If you're looking for a vino to pair with this, a Soave Classico or a White Burgundy make for lovely matches. To take the mushrooms full force, keep scrolling down for a mushroom variation. 1. Heat a small amount of olive oil in a sauce pan. Add the onions and sauté over medium heat until tender and translucent. (Add water if needed to slow down cooking if the onions start to brown too much.) Add the raw garlic and cook for another minute. Add the butter to the pan, as soon as it melts add the flour. Stir well to incorporate. Cook the roux over medium heat until lightly golden. 2. Once the roux is golden, stir in the roasted garlic. Whisk in the stock. Begin gradually making sure to deglaze the pan, as well as thoroughly incorporating the roux. Then you can pick up the pace while adding the rest of the stock. Add the lemon juice. Bring the sauce to a boil, then reduce to a simmer. Allow the sauce to reduce until it is thick enough to coat the back of a spoon. Taste and adjust seasoning with salt, pepper, and lemon as needed. Keep warm until ready to serve. If you have any sauce left, you can easily change it up and adapt this to suit your next dish. For one easy leftover makeover, sauté mushrooms then stir in any extra sauce. If you want to add mushrooms from the start, simply add them right after the onions have begun to soften. Allow some of the liquid to cook off, then proceed with the rest of the recipe. For the chicken dish above, I lightly grilled the chicken breast tenders on one side then flipped them over, added the sauce, and finished poaching the chicken in the sauce until cooked through. With chicken breast tenders the cooking all goes pretty quickly. I served the chicken with roasted heads of mini cauliflower and a side salad. I'd love to hear about how you use the sauce and any personal spins you add to it. I also, would love to hear about wine pairings that worked for you. For another sauce option, check out this fennel sauce. You’ll notice that the technique isn’t all that different.